Home Redistricting What is Redistricting? Redistricting is the redrawing of election district boundaries. Every 10 years, the United States takes a census. Those numbers are then used the following year to redraw election districts. Because election districts are based on population, the new census data triggers the redrawing of these election district boundaries. They not only include the Congressional Districts, but also the State Senate and House as well as local boundaries like City Council or Commission districts. The chain reaction begun by the US Census is accompanied by a series of rules and a lot of debate. The new boundaries are frequently challenged and even generate long, drawn-out court cases. The deadline for completing this process is a month or so before candidates need to sign-up to be on the ballot (or, to use technical terms, file their petitions). For most states, the whole process is to be completed by January 2012. The ability to select who represents us is at the very core of why the United States was founded in the first place. Most of us care about our taxes, roads, and safety. Since we care about those things we should also care about who makes those decisions — the people that represent us. The boundaries of districts (determined by redistricting) defines where the person who represents you and your community may live. Will your community be given a united voice or fragmented into little pieces and left with the effect of having no say? 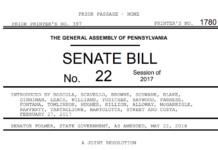 Redistricting, at least in PA, was originally intended to ensure that people not only were offered equal representation but united representation. If the people do not stay engaged with this redistricting process, then this intent may be lost in the political shuffle.